For several years I longed for a wheel made by Swedish makers Lindh or Korf. They are held to be very good, and they have a feature that is very handy especially nowadays when used wheels are sold almost everywhere: movable maidens. On the Korf wheels you can move both maidens, on Lindh the one closest to the spinner. After keeping an eye on buy & sell sites in Sweden for two years, my friend Elaine found a Lindh wheel she suggested I’d buy. And here it is now in my room! The movable maidens means that if you’re lucky, you can use a flyer assembly that was not made for your wheel. I tried a small flax flyer that I haven’t been able to use in any of my Saxonies before. I tested to spin cotton, and oh what a joy! 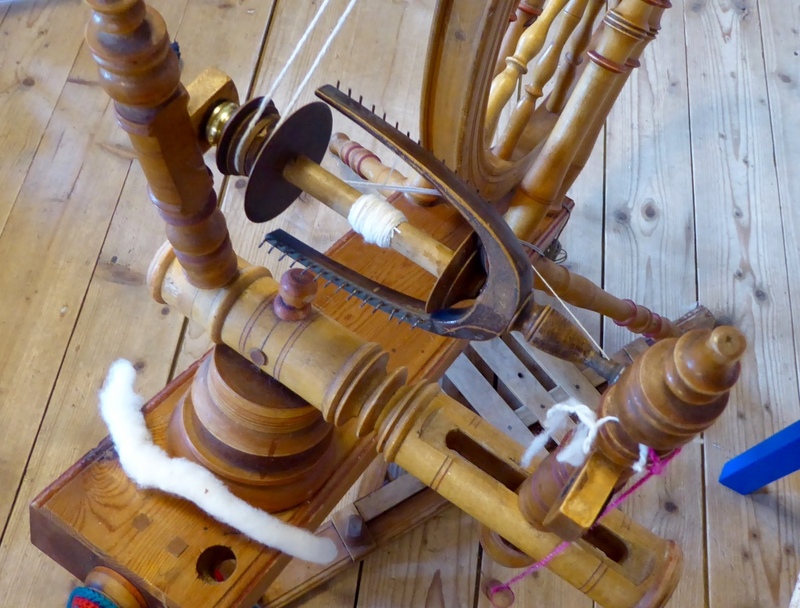 With that flyer my Lindh wheel is fast enough for cotton – I now have a cotton wheel! I need a ring or two next to the maiden in order to keep the drive band in the middle of the drive wheel. I’ve now found two rings that work better than the brass ring you see in the photo. To the left is one from a Finnish Saxony from Kiikka, a so called Kiikkalainen, with wool on the bobbin. I’ve mended the bobbin with a piece of card board, which works very well. You don’t always have to be so correct in what material you’re using! In the middle the small flax assembly, now with cotton. Fast! It’s so fast! I haven’t had time to try flax yet, but I know it was last used for flax as there was thin linen thread on most of the bobbins when I got them. To the right is the assembly from the Lindh wheel. It’s pretty much the same as the Finnish one, but you can’t switch them from one wheel to the other. The bobbin is shorter. 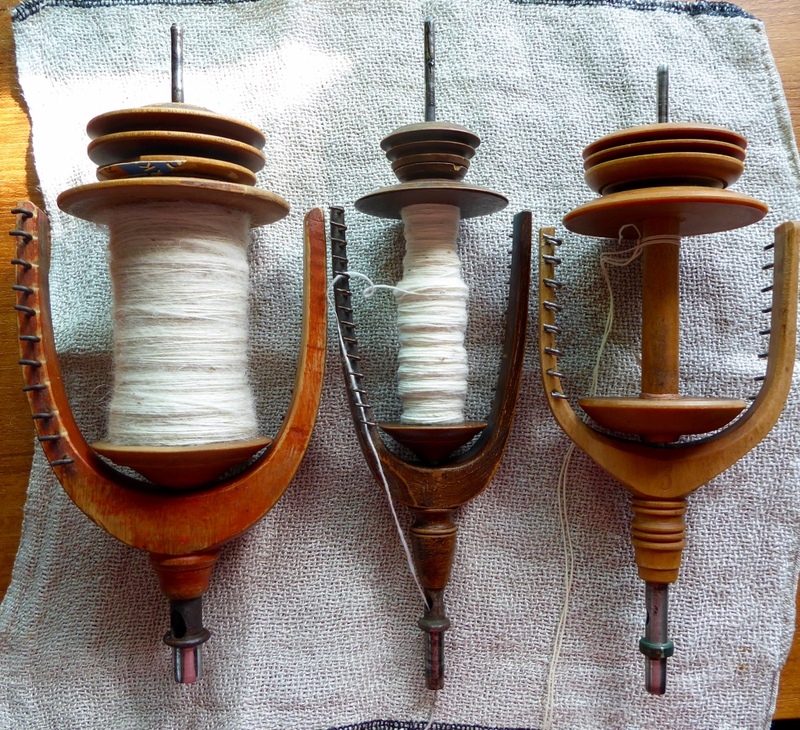 The two wool bobbins take 50-60 grams of singles, depending on how you spin. The finer you spin, and the more carefully you switch from one hook to another, the more yarn they take. I find the size of the bobbins an interesting question. You all know how big some of the standard bobbins are that come with new wheels nowadays. That has to do with the new wheel mechanics. It also has to do with the drive technique. I haven’t seen Saxonies with bulky flyer assemblies yet, even if there are some bigger ones made for plying, but never one as big as some of the Scotch tension wheels have now. I’ve wondered why? And always ended up marvelling at how my spinning gets worse and not so fun when I try to fill a Saxony bobbin over its capacity. When the bobbin fills up close to its limits, I automatically start to spin thicker to compensate for having to increase the intake. My yarn gets uneven, and the spinning doesn’t feel nice anymore. So I think that the wheel makers and spinners long ago came to a conclusion that the size most Saxony assemblies have now is optimal. 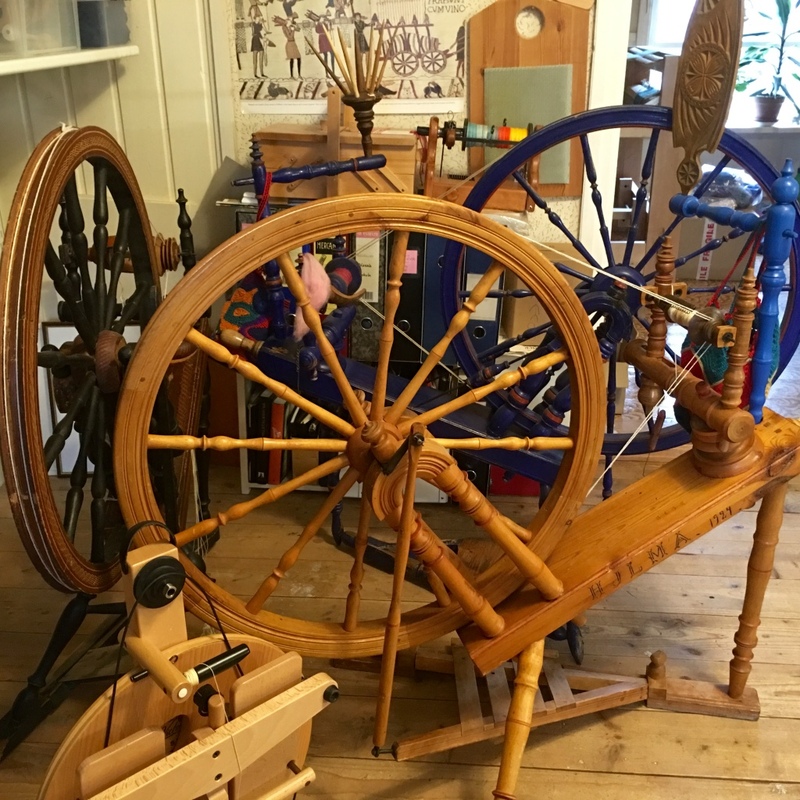 It’s what this double drive wheel can do, and it does it just so well: a consistent yarn, spun with the fast and beautiful woollen long draw. That’s what I like to spin most of all, and the best way to spin it is on a good Saxony wheel. When I want to spin short draw I choose one of my uprights with Scotch tension: Louet Victoria or Hansen Minispinner. I now have four Saxonies. Three of them you can see here together with Louet Victoria in front and Hansen Minispinner in the background. My fourth Saxony is retired and has to spend her days in the attic. The Saxonies from the left: the famous and much appreciated Finnish Kiikkalainen from about 1920 (a guess from my side), the blue very good Finnish one (from 1892) with unknown origin but probably from the Swedish speaking west coast, and the yellow Lindh wheel Hilma-Elaine from 1924. My ankles are in a bad shape, especially the right one that has been treadling for decades during the days when double treadles were rare. Look at the broad treadle on my Hilma-Elaine: I can use both feet. I can now spin a Saxony for more than a few minutes. Guess how that makes me feel, considering I love Saxonies! The first finished yarns I spun on Hilma-Elaine will be used in this year’s Shetland Wool Week hat, the Crofthoose Hat designed by Ella Gordon. 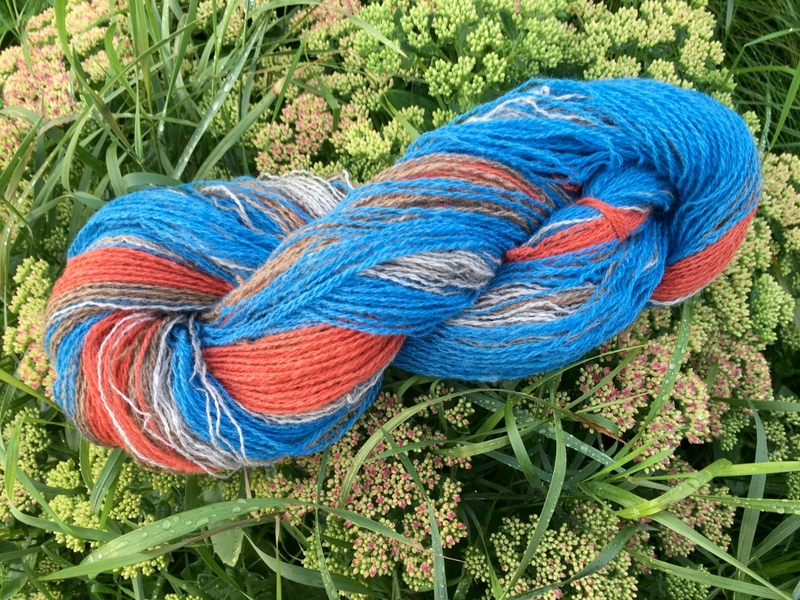 I sometimes ply yarns onto the same bobbin and make one skein of them, as in this case with red and blue Swedish Finull, grey Kainuu Grey, and natural brown Finnwool. Yes, in only a couple of weeks I’ll go to Orkney to see friends, and to Shetland for Wool Week! September 4, 2016 - 12:46 pm ElaineChicago. Such beautiful wheels, Barbro! You are so fortunate that friends were on the lookout (as well as you) for the Lindh wheel. I certainly admire the antique wheels but doubt that there are very many available over here unless they are estate pieces. Spin on and have a great time at Wool Week in your new hat!! There must be quite a lot of old wheels over there. So many immigrants took the wheel with them. Some of them must still be around. September 4, 2016 - 8:18 pm Marilyn F.
Yes, Spinning Wheel Sleuth is in my Top Sites. So I know there are quite a lot of wheels in your museums. 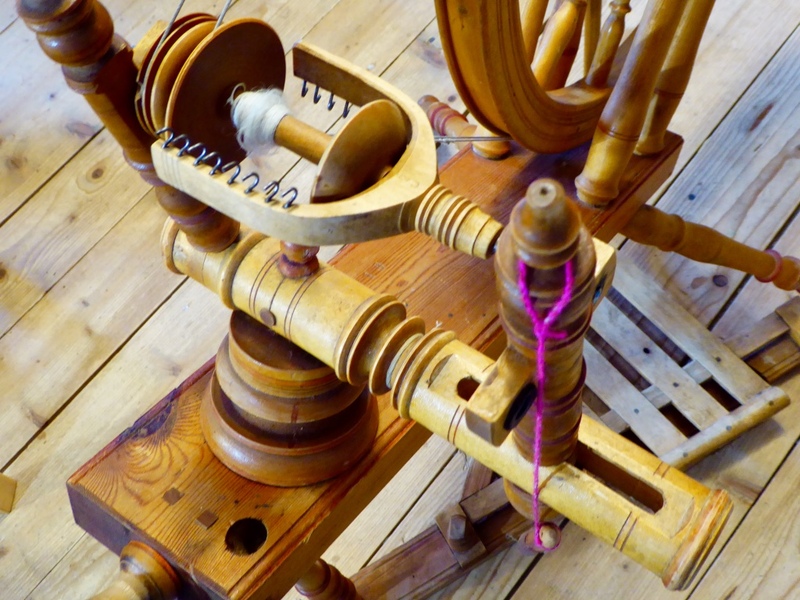 And there’s a group on Ravelry that is worth following: Antique Spinning Wheels. It has a buy-sell thread. September 5, 2016 - 1:50 pm Marilyn F.
Ah, so you like the SWS site. Great. I have heard about ASW, but so many temptations! I have purchased several functioning antique wheels over the years and eventually decided I didn’t have room for them and they now have other good homes. I would need a huge house to hold all the wheels I would love to have. LOL. September 4, 2016 - 1:34 pm Marilyn F.
WOW, Hilma-Elaine is such a beautiful wheel and with the added functionality of changing flyers – it makes her indispensable!!! Again, you are teaching us something new – a sliding maiden – something I have not seen before – but may now look for. Have a wonderful time at Wool Week!!! You will probably not come home empty handed. LOL. Such good information about what to look for to better be able to achieve certain effects. I do not have a working wheel yet, just pieces really, but I would like to get one someday, and this post will be very helpful!